1. The Most Magnificent Thing—trial and error + perseverance are the keys to a girl creating a magnificent thing, it's a nice s.t.e.m. book too. 2. 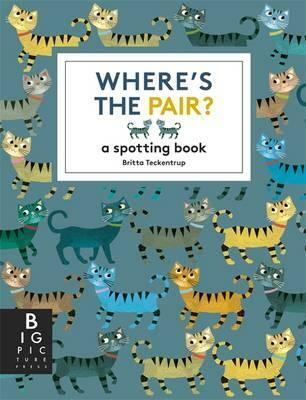 Where’s the Pair?—a spotting book by Britta Teckentrup (The Memory Tree). Gorgeous pictures, fun rhymes, challenging puzzles: a great way to get ready for reading and to practice looking for details. 3. Little Red Riding Hood Not Quite by Yvonne Morrison, illustrated by Donovan Bixley—a second book from this great team. It’s the same general premise as The Three Bears Sort Of (in our fractured fairy tale grouping). It's very funny and relatable for children and parents. 4. Peas in a Pod by Tania McCartney, illustrated by Tina Snerling—quintuplets who seem the same in every way turn out to be very different girls, showing that people are more than the way they look. Lots of P words to play with. 5. Under a Pig Tree by Margie Palatini and Chuck Groenick—the hilarious results of mixing up Pig and Fig. PS I've linked the books individually to Book Depository but you can also search for them via Amazon or Booktopia. And many thanks for supporting us by buying through our links!